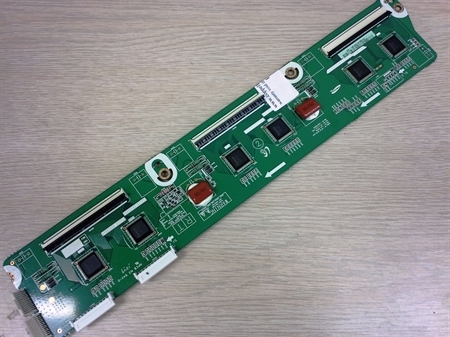 Get a new buffer board LJ92-02053A / LJ41-10376A used in Samsung PN64H5000AF plasma TV and then send your old dud to receive credit! This is a listing for a new, unused top buffer board LJ92-02053A / LJ41-10376A as shown on the picture. It is used in Samsung PN64H5000AFXZA plasma TV and possibly other models too. If we are out of stock for this item and you are not able to add it to your cart you may want to search for a listing for serviced and tested boards of the same model. You are purchasing a functional module that is same or 100% compatible with the one advertised in the subject of this listing. Upon receiving and installing the module in your set you have the option to return your old malfunctioning dud and receive credit towards the purchase price shown here, subject to the below listed conditions. The board you will receive can be brand new, used or, most commonly, a board serviced by us, Coppell TV Repair LLC. Unless it is brand new (which is rare for the modules we offer as we specialize in servicing hard to find or expensive TV boards) it is guaranteed the board will be tested by our staff and there will be a label on it attesting to it. Before placing an order please ensure that this is indeed the board in your set by comparing the number on it. A buffer board can fail in several different ways (probably even more than we have seen), but based on experience probably the most popular failure symptom of the TV would be periodic clicking from the power supply and the TV never actually starting up. A much better indication that a buffer has failed is establishing bi-directional (as opposed to uni-directional) and usually low, in terms of tens or at most hundreds of Ohms, resistance on the contact points of the large red capacitors found on the buffer board. We ship every business day M-F. Items under 14 oz are normally shipped with USPS First Class mail unless other option was available and chosen during checkout. Packages of 1 lb. and above are shipped USPS Priority, FedEx Ground/Home, subject to our decision. ATTENTION INTERNATIONAL CUSTOMERS: If your order is accepted by our store and your address is outside United States you may not be able to track package delivery progress once it leaves the country. The United States Postal Service (USPS) does not provide tracking information to some countries unless the shipment is the most expensive Express type, which is usually too expensive to justify using. You can accept that condition and strip Coppell TV Repair LLC of responsibility to the delivery status of your package provided we show it was shipped and processed by a courier in a timely manner. Or you can contact us prior to ordering and inquiry for delivery confirmation shipping method, which, again, usually costs an arm and a leg compared to the simple USPS First Class shipping. Unless otherwise explicitly stated elsewhere in the listing the boards we sell come with a standard 90 days warranty. Customer is responsible for return shipping and Coppell TV Repair LLC is responsible for shipping back to customer. Returned boards subject to exchange, service or refund, subject to availability and agreement by Coppell TV Repair LLC and customer. Returned boards must carry the Coppell TV Repair LLC identification stamp or label and must not have been damaged, modified or otherwise tampered with in order for warranty coverage to remain in force. Boards returned with request for refund / order cancellation will be subject to restocking fee covering forward shipping cost, transaction cost and $10 fee for the board testing needed prior to slating it for sale again. Upon receiving and installing the purchased module you can return your old one to receive the advertised credit. The credit will normally be issued as a partial refund towards your original payment; when this is impossible or inapplicable we may use other forms of payment such as PayPal or check. It takes 2-3 business days after the delivery of your board to us for it to be processed and the refund issued. 1) It must be sent back within 14 calendar days of the delivery of the module you purchased from us, both per carriers' records. Make sure you keep your tracking number, you may need it! 2) The board must arrive in good physical condition allowing subsequent electrical repair and reuse of the board. Sometimes when components fail and burn they also leave burn marks on the board. Most of the time such traces are not affecting the ability to restore the board's functionality, but in some extreme cases this may be a problem. 3) The board must not have missing or replaced components or have otherwise been tampered with. Exceptions vary from all 3 listed conditions, but we reserve the right to be the judge on whether your board qualifies for an exception. If a board arrives that does not meet the above conditions and we do not consider it appropriate for extension we will contact you and offer you to get it back for the sole cost of the return shipping and/or offer you a trade-in price we consider reflecting its condition. The returned module must arrive in good physical condition and without previous traces of repairs or tampering in order to qualify for the full advertised credit. Modules that do not meet those criteria will be subjected to partial refund or no refund at all (depending on their condition and trade-in value).